Board certified Oral and Maxillofacial surgeon Dr. Reed Van Wagenen grew up in the Fresno/Clovis area and graduated from Clovis High School. He attended California State University at Fresno and then received his Bachelor of Science degree from Brigham Young University. He received his DDS degree from the University of Texas Health Science Center in San Antonio, graduating with honors. He was involved with research on jaw function and chewing forces in jaw reconstructive surgery and published his studies with Dr. John Rugh. He decided to continue his education and completed a residency in Oral and Maxillofacial surgery at the University Medical center in Fresno, California in 1990. He is a Diplomate of the American Board of Oral and Maxillofacial Surgery and a Fellow of the American Association of Oral and Maxillofacial Surgery. He is a member of the American Dental Association and the California Dental Association as well as the Fresno Madera Dental Society. 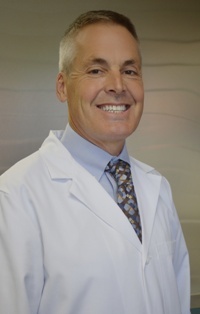 He is the co-director of the Central Valley Dental forum which provides continuing dental and implant education to restorative dentists and dental hygienists. Dr. Van Wagenen has been married to his wife Shelley for almost 30 years and they have 5 terrific daughters, a wonderful son-in-law and two adorable grandchildren. He enjoys outdoor activities including water sports, snow skiing, running, bike riding and triathlons. He has competed in the Boston Marathon and in several Ironman triathlons.